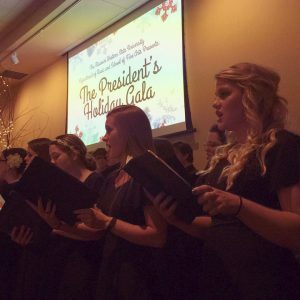 The Department of Music in the School of Fine Arts at Missouri Western State University will hold the fourth annual President’s Holiday Gala at 7:30 p.m. Thursday, Dec. 6 in the Fulkerson Center. Admission is one can of non-perishable food for Missouri Western’s Campus Cupboard, the student food pantry. The President’s Holiday Gala rings in the holiday season with performances by all ensembles in the Department of Music. This year, the gala will also be a celebration of the work and legacy of Dr. Robert Vartabedian, who will retire next summer after 11 years as Missouri Western’s president. For more information, contact Dr. Elise Hepworth, director of choral studies and music education, at ehepworth@missouriwestern.edu.